We explain what the long multiplication method is and review how multiplication skills are built up through each year of primary school. Long multiplication (or column multiplication) is a written method of multiplying numbers (usually a two- or three-digit number by another large number). It is usually used in Year 5 and Year 6 once children have got the hang of using the grid method. The benefit of the grid method is that it encourages children to think about place value and multiply multiples of ten and one hundred. 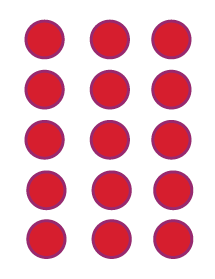 Once they have got the hang of this, long multiplication is a faster, more efficient technique to use. Children's multiplication skills are built up through their time at primary school as follows. Be aware that in the academic year 2014-2015, children in Years 2 and 6 will continue to follow the old national curriculum, while those in other years move to the new curriculum. From September 2015, children in Years 2 and 6 will also follow the new curriculum. Count on or back in ones, twos, fives and tens. Solve one-step problems involving multiplication using objects and arrays with the support of the teacher. Recall multiplication facts for the 2, 5 and 10 times tables and related division facts. Use repeated addition (representing 4 lots of 3 as 3 + 3 + 3 + 3) and arrays to work out multiplication questions. Recognise multiples of 2, 5 and 10. Use the x and = signs when writing multiplication number sentences. Solve problems involving multiplication using objects and arrays (see diagram above). Recall multiplication facts for the 2, 3, 4, 5, 8 and 10 times tables and the corresponding division facts. Use written methods to multiply two-digit numbers by one-digit numbers (for example: 13 x 4). 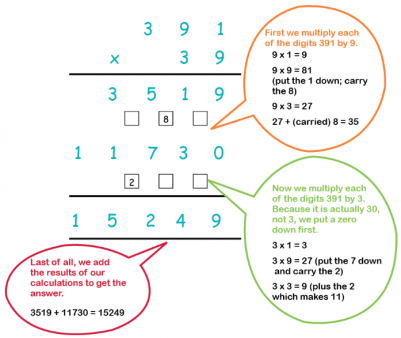 Recall multiplication facts up to 12 x 12 and corresponding division facts. Recognise and use factor pairs. Multiply two-digit and three-digit numbers by a one-digit number using a formal written layout. Recognise prime numbers have only two factors and identify prime numbers less than 100. Understand square and cubed numbers. Multiply numbers up to four digits by a one-digit or two-digit number using formal methods, including long multiplication. As you can see from the above objectives, children do not need to multiply two-digit numbers by three-digit numbers until Year 6, so the long multiplication method would probably not be taught until then (although able Year 5 children may use it as well). Multiply numbers up to four digits by a two-digit number using long multiplication. Identify common factors, common multiples and prime numbers. Multiply one-digit numbers with up to two decimal places by whole numbers. What are multiples and factors?